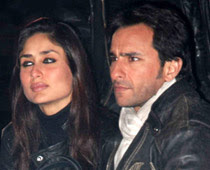 Saif Ali Khan and Kareena Kapoor are the latest Bollywood stars to criticise the government for failing to tackle terrorism and protect citizens. Both said they were "disgusted" with politicians "who provide no leadership" while arming themselves "with so many security guards". The actors were busy shooting for Renzil D'Silva's untitled project in Philadelphia when the mayhem broke loose in Mumbai Nov 26. "The government has failed us again. The BJP (Bharatiya Janata Party) is advertising for votes while the bodies of the dead have not yet been cremated. Mr (Narendra) Modi had offered Rs 10 million to the widow of Anti-Terrorism Squad (ATS) chief Hemant Karkare. The news has shaken the foundations of our city and destroyed our already shaky belief in our government's ability to protect us," Saif wrote in a statement circulated to the media and signed by both. Added Kareena: "I am disgusted with the so-called political leaders who provide no leadership and ironically surround themselves with so many security guards while doing little or nothing for the security of the people who have voted them to power. Saif also slammed the terrorists for killing "innocent people" in the name of "god" or "religion". "As an Indian and a Muslim, I feel like expressing my condemnation and outright disgust at any party killing innocent people in the name of god, Allah or whatever we choose to call him. "I am so worried that the whole religion (Islam) will be judged and condemned. There are strong communal feelings running through all strata's of our society and I find it hard to defend the fact that there seems to be a Muslim hand behind every detonator. I feel a little scared as a Muslim now," explained the actor. The couple offered commiseration for the families who suffered at the attacks and praised the police and media for their endeavours in tackling the situation. "Saif and I would both like to offer our deepest condolences to all the bereaved families and I want to applaud the media for being pro-active and for being the force that is trying to unite the nation," wrote Kareena. Saif added: "I would like to thank the NSG (National Security Guard) and the Mumbai police who handled the situation so well with so little on their side in terms of equipment and support."